A local attorney is calling for a criminal investigation of the KCK Police chief's lease deal with the Unified Government to rent a taxpayer owned house as his residence. Henry Service calls that deal problematic. 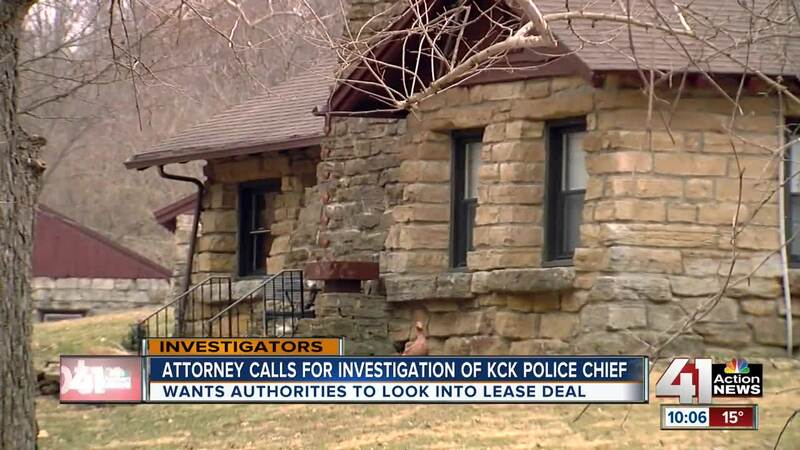 KANSAS CITY, Kan. — A local attorney is calling for a criminal investigation of the KCK Police Chief's lease deal with the Unified Government (UG) to rent a taxpayer owned house as his residence. Henry Service calls that deal for Chief Terry Zeigler problematic. "I'm the last to say something is illegal unless I have good evidence. But it would be worth a look at," Service said. Zeigler's lease agreement is for a lake house owned by the UG at Wyandotte County Lake Park. As the 41 Action News Investigators first reported in November , Zeigler moved into the home in January, 2018. Under terms of his deal, the UG has given the chief more than $18,500 in credits for fixing up the property. Those credits nearly cover his entire two year lease which expires at the end of 2019. The credits include money for building materials, labor and gas mileage. Zeigler also gets free utilities. "And none of that went out to bid, so I think that's problematic," Service said. The chief had a different take when the 41 Action News Investigators talked with him in November. "I mean it seems fair. A lot of landscaping has been done out there, a lot of work on the house," Zeigler said in November. Since November, the 41 Action News Investigators obtained Zeigler's work schedule records as chief during the roughly seven months he was also fixing up the lake house. Those records show the chief took paid time off on 14 different work days during the Monday through Friday work week, including a sick day. His lease record shows Zeigler also charged the UG labor costs for fixing up the lake house on those same paid off days. Service believes those double payments or credits are the most troubling part of the lease deal. "This is the city paying you and giving you the money for your time off and then paying you again," he said. "When you look at the time, it would just depend on what I had going on whether I took a day off or not after hours, but there's no double dipping," Zeigler said in November. But records show the UG repeatedly paid or credited Zeigler twice on the same day. It happened not only the 14 days he took time off, but also five days when he worked a regular 8 a.m. to 5 p.m. shift. For example on Friday, December 29, 2017, Zeigler took a paid comp day off at his salaried rate of roughly $75.38 an hour, or more than $600 for the eight hour work day. That same day, his lease shows Zeigler charged the UG 10 hours of work on the house at an agreed upon labor rate of $21.92 per hour. He charged another 10 hours of labor for his mother for "began cleaning house, walls, windows, blinds, trim, kitchen, fireplace & basement". Zeigler's total credit towards rent that day in labor alone was $438.40. Zeigler also was given another $69.59 in credits for cleaning supplies, keys to the gate lock to get in and out of Wyandotte County Lake Park after hours to access the house and for extra keys to the house. Altogether, the UG gave Zeigler $507.99 in credits on that one day alone, more than enough credits to cover his entire first month's rent of $500 when he would move in a few days later. Combined with his comp day, the UG paid Zeigler more than $1100 in paid time off and rent credits for the same day. On January 5, 2018, Zeigler took another paid comp day off at his now increased salary rate in the new year of roughly $76.88 an hour. Zeigler charged the UG 19 hours in labor credits that day. But his notes say he worked 11 hours on "wiring issues with lighting, cleaning and duct work" and "Mom-7 hours" for what should've been 18 hours. So there was a one hour charged labor cost mistake in his favor. On Tuesday, January 16, 2018, UG records show Zeigler took a paid sick day off as police chief. However on that same day, Zeigler charged the UG 4.5 hours of labor credits for "laying trim in family room & replacing light switches". "We've never seen it where you can get paid twice from the same entity when you're tasked with doing one job. And then have a no bid contract basically to fix up your own place which is a really nice lake house. That doesn't look good and I think it would be worth looking into," Service said. The 41 Action News Investigators reached out to Zeigler and Wyandotte County Administrator Doug Bach to get new reaction to the time sheet documents and his lease arrangement charges. However, both men decided to let their previous November comments stand. "I would venture to say that when me and mom were out there cleaning, that's when I was probably on vacation and I was trying to get everything done," Zeigler said in November. "We have now a good asset that's back in our inventory we didn't have money to put back into it. It's also nice having law enforcement that resides within our lake property so if there were something there, we have our own chief right there," Bach said in November. The breakdown of Zeigler's 14 work days off when he was also charging the UG labor for work on the house include 10 comp days, two holidays, one sick day and one vacation day. The one vacation day was Friday, May 18, 2018. On that day, Zeigler charged the UG 2.5 hours and noted "cut grass & weed eated". However a worker with the UG's Public Works Department, which has a headquarters next door to the lake house, told the 41 Action News Investigators that department cuts the grass because it's part of Wyandotte County Lake Park. In addition to the paid off days Zeigler took to work on the house, there were five other days when Zeigler worked a regular 8 a.m. to 5 p.m. shift and also charged the UG labor costs for working on the house. One of those days was Thursday, April 26, 2018. On that day, Zeigler charged the UG 10 hours of labor for two people for "bridge & clearing creek". Lease records don't show who the two people are who did that labor. The previous week on Thursday, April 19, 2018 Zeigler took a full paid comp day and charged the UG 12 hours of labor for two not identified people for "bridge, courtyard & cleared debris from bridge demolition". There's also another potential discrepancy in UG records on Thursday April 5, 2018. In one set of records, it shows Zeigler took 2.5 hours comp time on that day and charged the UG 2.5 hours of labor for "worked on stone in courtyard". However Zeigler's actual time sheet shows he worked an entire regular shift without taking comp time. "If the police chief gets to fix up a nice lake house, then I want to know where I can sign up for that. It's a question of fairness. If you can make six figures, you can get to get a really nice lake house. You can get paid for fixing it up. That's a really sweet, sweet deal," Service said. A spokesman for the Kansas Attorney General's Office says any investigation of the chief's lease deal would have to be done by the Wyandotte County District Attorney. A spokesman for that office says the police department's internal affairs unit would have to file a complaint against the chief for the D.A. to open an investigation. Community activist Janice Witt filed a lawsuit against Zeigler and the UG in late November based in part on the lease deal. Witt recently dropped that suit. But she left the option of bringing it up again.